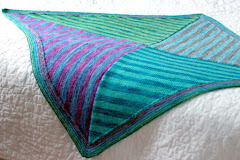 Last week was really big as far as weeks go here at Tanis Fiber Arts. I got my first BIG order! I've been selling my yarns at my LYS for a couple months now, and they've been making orders as I've been making colours. 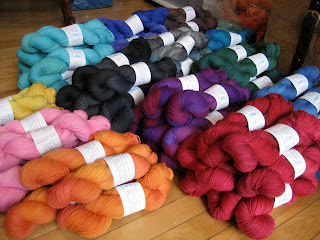 So although they've cumulitively ordered the most yarn, it wasn't all at once. 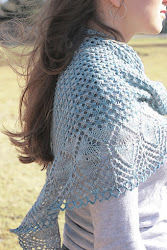 Beehive Wool Shop contacted me last week and placed an order for 92 beautiful skeins! They looked lovely all waiting to be packed up and shipped on my living room floor. It was a big deal for me because now, people on the West Coast are going to be able to pick up my yarn at their LYS, it's mind boggling. So, now I'm officially in 3 stores, the 2 mentioned above, and Greenwood Quiltery a beautiful fabric and yarn store in Guelph. This weekend, Chris and I barely left the apartment. The weather was miserable, for once, we didn't have anything that we absolutely had to do, it was a perfect, lazy, pyjama's all day kind of weekend. So, I decided to give the socks a break and continue working on a blanket that I started months ago (maybe even a year ago... I can't even remember!) 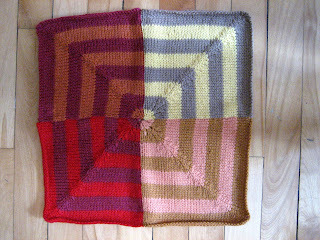 It's the mitered square blanket from the Mason Dixon knitting book. It's gorgeous. I'm making mine to hopefully fit snuggly on the top of a twin bed, or sloppily on my lap on the couch. 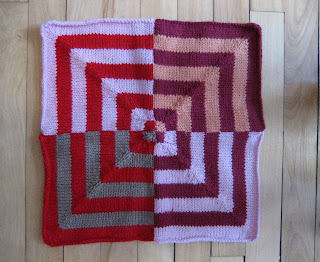 It's going to be three by four squares. Unlike many people who approach this blanket, I'm not going at this casually, I have very strictly and specifically chosen my colour layout. It's going to be a rainbow, starting with red's in the top left corner and subtly flowing through the orange, yellow, green, blue, indigo and ending with the violet in the bottom right corner. It's all mapped out, and even though some of the orangey squares aren't exactly my taste, I am confident that when all sewn together the overall affect will be worth it! (Hopefully!) So, I'm sticking to the plan, and trying to avoid the problem of endless miles of mattress stitch at the end by sewing up as I go. 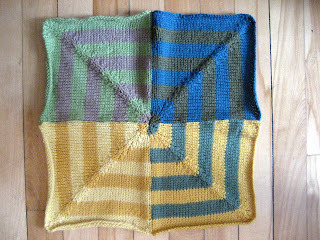 Bellow are the first three squares, you can already start to see the transition of colours right? 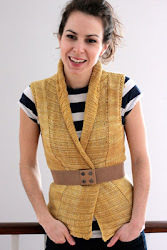 I'm knitting it using Elann Peruvian Highland wool. I love it. Elann rocks. The colour selection when I bought the yarn was amazing, I know that now they don't have all the colours, but I got lucky. 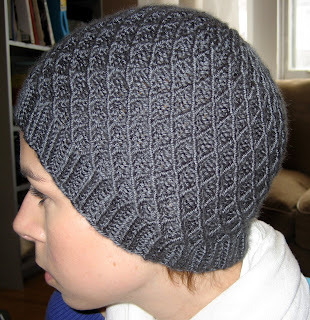 And the yarn is very soft and nice to work with. When I'm done I suspect I'll have lots of leftover bits to knit a great hat/scarf/mittens or something. Maybe even a sweater! 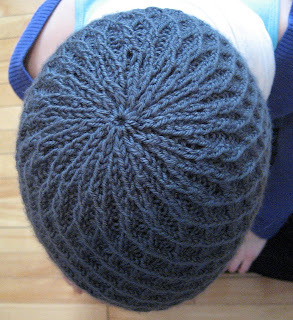 I have a new favorite style of hat to knit and wear. I made these two hats recently, both were intended as gifts but only one actually got given away. They're very lovely and hard to part with! 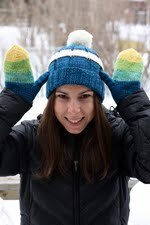 In December I made Shedir from knitty.com for my brother Vince for Christmas, but in the end found him a gift that I knew he would like better and ended up keeping the hat for myself. 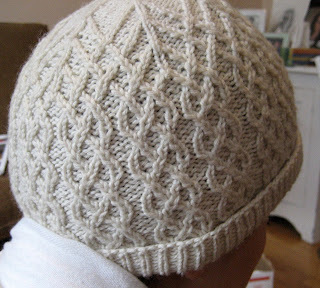 I wear it everyday and absolutey love it, the tiny cables and gorgeous crown pattern really make me happy. When Chris wears it around the house and I get to study it on someone else I really marvel at the pattern. Genius! Next I made Koolhass by Jared Flood. 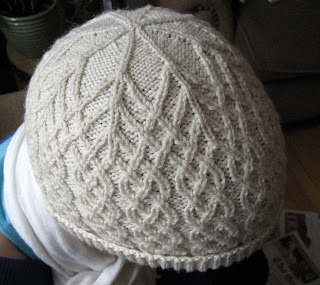 Another lovely pattern with a complex crown and tiny cables. I made this one for Richie for his birthday and actually did manage to part with it this time. 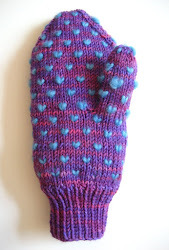 It was a reletively quick knit so I'll definitely be making more. I just love showing off tiny cables! Who knew I was so easily amused?